Should you consolidate student loans or not? This is a question we have an entire generation asking. Is it worth it? What are the advantages and disadvantages? If I have some federal and some private student loans, can I refinance them together? It seems that something has gone awry with our higher education system. This system probably needs to be addressed on a larger scale. While those points need some serious consideration, let's talk about you, the individual. You still have your student loan debt. Thankfully, there is something you can do about it. There are legitimate ways you can refinance and/or consolidate student loans that could work great for your situation. The Obama administration decided that debt collectors could not charge high interest rates (upwards of 16%) on outstanding older FFEL student loans. Provided the borrower entered a debt rehabilitation program within 60 days. The Trump administration just told debt collectors to disregard former President Obama's memo. This could mean higher interest rates for you, but it shouldn't affect you unless you have a specific FFEL loan. Check and see if you are not sure. Is there a difference between Student Loan Consolidation and Refinancing? Yes. There is, but they are similar. Debt Consolidation is when you take out a new loan to cover the balances of your other loans. This simplifies the repayment process because you have one payment to make instead of a bunch. But, it will more than likely lengthen the repayment time, thus increasing overall interest payments. When it comes to Consolidating federal student loans, they are combined into one loan and your new interest rate is a weighted average of the interest rates of all your student loans. That means that though your payment process is simpler, you are typically paying a 1/8% higher interest rate overall. No money savings. This is typically referred to as a “Direct Loan Consolidation”. You may be able to qualify for an Income-Driven Repayment Program which can give you more flexible repayment terms. This includes parent PLUS loans. But consolidation can disqualify you from some benefits of Perkins loans. This is a legitimate option to get any loans out of default that you might have and retain your federal loan benefits like forbearance, deferment, and loan forgiveness. With Federal Loan Consolidation, you can't mix in any private student loans you have. Those will have to be handled separately. But, even if you've consolidated your loans already, you can still refinance through a private lender. Loan Refinancing is when you take out a new loan to repay existing loans, but you have the added benefit of getting a lower interest rate (if lower rates are available). This can simplify your repayment strategy and possibly lower your repayment period or amount. You CAN refinance your federal loans (consolidated or unconsolidated) together with your private loans using a private lender. Consolidation is only for Federal Student Loans, but refinancing will work with all student loans (private and federal). Clear as mud? When you choose to refinance a federal student loan with a private loan company, like SoFi or Credible, you are actually consolidating and refinancing your loans at the same time. Since refinancing with a private lender will, in essence, convert your federal loans into private loans, you will lose any Federal loan benefits you had. But that doesn't mean it isn't worth it. If you are not going to take advantage of those benefits, then it will probably be worth it to cut years and/or thousands of dollars off of your loan repayment. You will need to weigh your options carefully. You would like one lower monthly payment – this might come at the cost of a longer term repayment and more overall interest paid. You would like to get more or retain your Federal loan benefits. The real advantage in Federal Loan benefits comes in the form of safeguards if you are going to have trouble paying them off. So, if you are struggling to find a reliable and decent-paying job and/or your income is very tight, these safeguards could be really helpful. If the opposite it true – if you have found good long-term employment; you will likely not ever need to use your Federal Student Loan benefits. If you are unfamiliar with exactly what type of federal student loans you have, you should check. Federal loan consolidation is free through StudentLoans.gov. So don't believe any company that says you need to use them and pay them service fees. 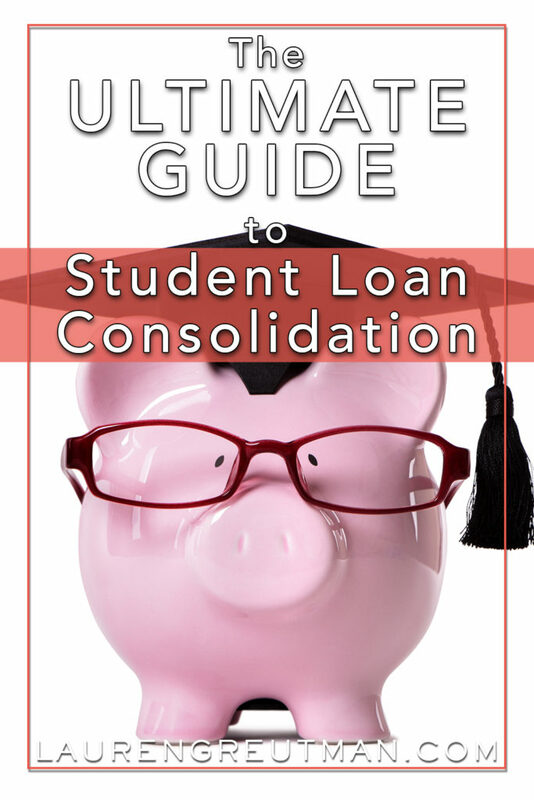 You can review your Federal Student Loan Consolidation options HERE. Should you Refinance Student Loans? Student Loan Refinancing has proven to be an excellent option for many graduates and former students. The key point when looking to consolidate student loans or refinance them is: “What will the advantage be for you?” Logically, if there is no advantage, what is the point? A great first step is to put your student loans into a loan calculator. This will show how long it will take you to repay all of your loans with your current interest rate and loan amount. You can then match that against the lender's new interest rate offerings and see the amount of savings you can get. Consider refinancing if you will not use your Federal student loan benefits. A loan calculator can clearly show if you will save money (or not), this could be the solution you've been looking for. Since the calculator is free, there's no harm in just checking. Refinancing becomes a better option if you have a strong income stream and a favorable credit score. In the calculator, pay attention to the interest rates. Interest rates can either be variable or fixed. Compare the difference between the two. The interest rates available to you will depend on your credit score, income, and overall debt amount. Use this Loan Calculator to see if Refinancing will save you money. SoFi – Stricter approval process, but better rates. Depending on your financial situation, you may feel stuck. Maybe you are struggling to find employment and your credit isn't the best. You can still come up with a workable plan to pay off your student loans without consolidation or refinancing. Treat your student loans like any other debt and focus your energy on knocking them out as quickly as you can. I've made a tool that will give you your own personalized Student Loan debt payoff plan! Click HERE if you're interested. Our debt payoff plan allows you to put in all your Student loans (and any other debts), and see a debt payoff schedule based on whether you'd like to tackle the lowest balance first or the highest interest rate first. So, you have the option to decide which debt payoff method is best for you. Thanks for the helpful article! Does consolidating your federal loans also put you at risk to lose your federal loan benefits? I only ask as I consolidated right after college (without doing any research…I know better now!) and I thought I lost the benefits then. It has been a few years so I don’t recall fully, however. Another thing to look at is ensuring it still counts as a student loan in relation to your taxes. I am not sure if this is true of all student loan refinance companies, but when I refinanced I made sure to read the FAQ so I knew I could still get student loan tax benefits on the interest. Do you have any further insight on this? Also – another company to look at for student loan refinancing is Earnest! I chose them and have been with them for over a year now, with a better rate than my federal loan. They also have benefits – and I had to use them. They held up their side! I got laid off, and needed to use their 3-month deferment option for unemployment. It was a HUGE help. Though not ideal, since they still accrued interest – while out of work I didn’t have to worry about collections or a negative hit on my credit score.